I have been made an Unconditional offer at Warwick and have accepted it as my ‘Firm’ choice via UCAS. What happens next? 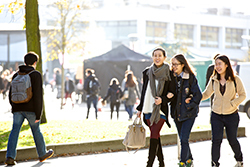 Congratulations – your place at Warwick is already guaranteed and you do not need to contact us to confirm your place. We will, however, still be happy to help you with any queries you may have over the summer and look forward to welcoming you onto campus in October. I have not been accepted at my ‘Firm’ choice university but I am holding an Unconditional Insurance (UI) offer at Warwick. What happens next? Congratulations – your place at Warwick will be guaranteed. When your Firm choice university confirms with UCAS that they are unable to offer you a place, UCAS will automatically confirm your place at Warwick and you do not need to contact us. You will be able to check the status of your application via UCAS Track which is updated daily. I really wish I had worried much less in the time leading up to my arrival at Warwick. I think my main worry was that I wouldn't be 'good enough', that everyone I met would be much more intelligent than me. I realise now that worrying was a complete waste of time; I'd applied and been offered a place after all.